Blackberries, Blueberries, Xylitol, Lime Juice, Lemon Juice, Natural Pectin, Calcium Water, T.L.C. Raspberries, Lemon Verbena, Xylitol, Lemon Juice, Natural Pectin, Calcium Water, T.L.C. Strawberries, Xylitol, Rhubarb, Orange Juice, Lemon Juice, Sugar, Orange Zest, Cardamom, Natural Pectin, Calcium Water, T.L.C. Xylitol, Figs, Raspberries, Orange, Ginger, Sugar, Natural Pectin, Calcium Water, T.L.C. Rhubarb, Blueberry, Maple Syrup, Xylitol, Sugar, Lemon Juice, Vanilla, Spices, Natural Pectin, Calcium Water, T.L.C. Sour Cherries, Xylitol, Sweet Cherries, Lemon Juice, Natural Pectin, Calcium Water, T.L.C. In the late summer and early fall we gather sumac and grapes that grow wild along the forest’s edge of our property. We find the crab apples and Damson plums in neighbouring farmer’s hedgerows and abandoned fields. It helps to know the farmer who owns the land! Damson plums are hard to come by. Originating in Asia, they were introduced to England during the Roman era where they became a very popular fruit to preserve and make dye from. When settlers from England came to Canada they brought these seeds with them however, as European plums (their cousins) are 10 times the size of the Damson plum, they never really caught on here. The trees we’ve been lucky enough to find are very old. Availability of these products is based on what they yield in any given season. We are at the mercy of the gods making these products true gems to be enjoyed. 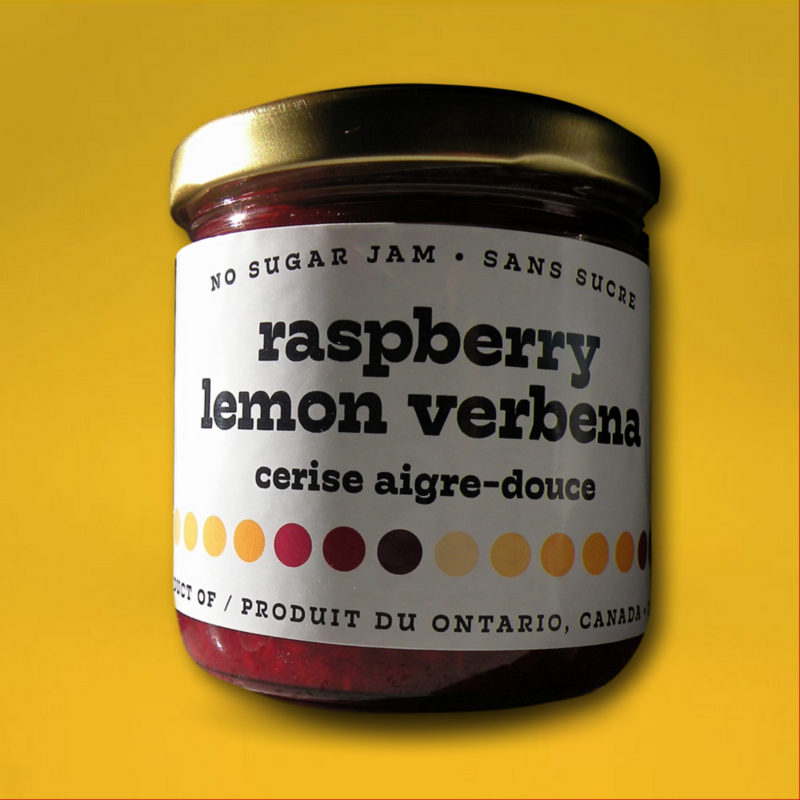 In keeping with our motto to “deliver real flavour naturally”, these jams and jellies are made low in sugar using natural pectin with a ratio of 4 cups fruit to 1 cup of organic sugar. All the wild fruit products are sweet and tangy in flavour. Excellent as a breakfast jam they are also delicious when paired with cheeses, ham, pork, turkey, chicken and wild meats such as; venison, moose and duck. Skip the cranberry sauce this year and use this. You’ll be a convert, we promise. Try this with goat cheese or cream cheese too! Wild crab apple juice, organic sugar, lemon juice concentrate, pectin, calcium water. A natural combo with peanut butter but also excellent with strong cheeses and wild venison. Wild grape juice, organic sugar, lemon juice concentrate, pectin, calcium water. A real treat any way you use it! Damson plums, organic sugar, lemon juice concentrate, pectin, calcium water. The aboriginals made tea from the sumac dupes. This natural antioxidant is full of vitamin C.
Sumac juice, sugar, lemon juice concentrate, pectin, calcium water.